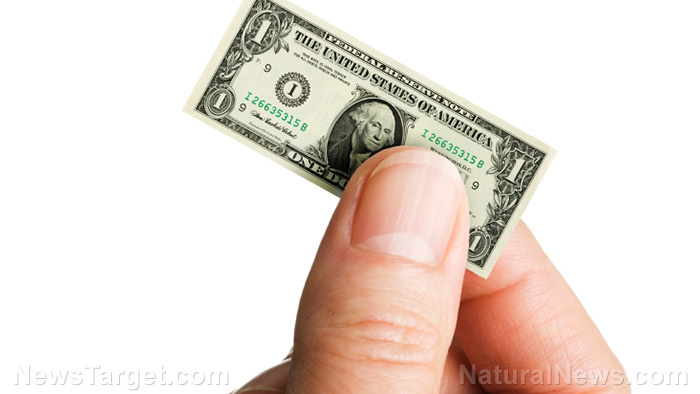 (Natural News) As the Federal Reserve pumps outrageous sums of currency into the economy, the purchasing power of the dollar shrinks. To adapt to the ongoing collapse of the dollar, you must strategically diversify your investments and income streams, while reducing frivolous expenses and debts that do not benefit your future. Here are some ways to prepare for an economic collapse. Some people believe that, if the economy collapses, the banks will disappear and all debt will be forgiven. This mindset is only an excuse to stay in debt. As you make excuses for your debt, you only give lenders more power over your life, which limits what you can do with your income. Start your debt-free quest by saving up an initial emergency fund of $1,500. When you pay back your debts, starting with the smallest and working your way up, you build momentum, which spills over into every other aspect of life. When you get to keep more of your income, you get back control over your destiny. The key to getting out of debt and preparing for your future is simple math, but you can’t solve your financial math problems if you don’t have a budget. With a budget written out monthly, you can minimize frivolous expenses and free up more of your income. Your monthly budget should include every bill, debt, and necessary expense (the big and the small). Any money left over in the budget should be used to pay down debt or invest in your future. You don’t have to stay content with your income. If you want more freedom and flexibility, you’ll have to be steadfast and smart and work to diversify and increase your income streams. The advent of the internet marketplace has made it easier to pursue passive income streams. Have you considered turning your hobby into a profit-seeking business? What skills can you bring to the internet marketplace? In the event of an economic collapse, people will seek out what is most important to them. While many will continue to smoke dope and drink their sorrows away, there will come a time when food and clean water become the most valuable resources. Invest in nutritious long term store-able foods that will sustain your body in a crisis situation. Invest in water purification elements and stock up on water for emergency hygiene and cleanliness. If you plan to barter instead of exchanging currency with people, invest in useful tools and items that people will surely appreciate and respect. If people stop believing in the dollar, certain items will become like currency in a trade-based economy. This could include toilet paper, soap, batteries, gasoline, seeds, ammunition, water bottles, diapers, lighters, MREs, etc. Some communities may band together and share sought-after items, but others will keep these important items to themselves and charge a premium price. If you have sufficiently invested in tangible goods, you will have stronger buying power if people start bartering more rapidly. In order to protect yourself long term, you should become self taught in many areas where real life skill is important. Network with knowledgeable people and use the internet to learn new trades and skills. Become your own mechanic, farmer, teacher, doctor, and medicine maker. Sometimes it’s smarter to delegate work or seek professional help, but many times you don’t need help at all if you are ambitious, confident, and passionate. When you are self sufficient, you do not depend on systems that take advantage of you. If you believe that gold and silver will be exchanged when the dollar collapses, invest in precious metals. The intrinsic value of precious metals is steadfast, but market values fluctuate often. Do your research before putting too much money into precious metals. If you believe in your 401k, put money into it and hope you never have to touch this money before retirement. If you have to access it, you’ll be taxed onerously. If you invest this way, pray you are still alive thirty years from now and have access to these funds. If inflation doesn’t eat at your gains, an economic collapse could wipe it all away in a blink. Don’t put all your eggs in one basket. If you put all your money in a safe, you could be robbed at gunpoint or lose it to a fire. If you put all your money into firearms and ammunition (which hold value), it may sit in a pile after your funeral, and you missed out on opportunities to enjoy fun trips with your family. All in all, you are in charge of your priorities and what you want to get out of life. The goal of preparing should be peace of mind – not worry. Since memories are the real currency of life, don’t forget to invest in ideas and ventures that give you more time to be with your family and friends. Previous :Have you tried any of these natural alternatives to antibiotics?